Hospital Lockdowns Can Leave Patients' Loved Ones Locked Out Hospitals are preparing for how to handle mass shootings in case the next one is in their backyard. One difficult call is whether to lockdown the facility, which can have emotional consequences. First responders transfer patients from ambulances to Broward Health Medical Center in Ft. Lauderdale on the afternoon of Feb. 14. The hospital was on lockdown after receiving victims of the shooting at Marjory Stoneman Douglas High School. Amanda Ray Carrillo was pregnant with her fifth child, and she was bleeding. She'd been admitted to Broward Health Medical Center in Ft. Lauderdale the day before but hadn't gotten answers yet about what was wrong. She wanted her mom to be there when the doctor came to explain. When Patterson got to the hospital, there was a security guard blocking the door. The facility was on lockdown after receiving several victims from Marjory Stoneman Douglas High School. Earlier that day, a gunman had opened fire at the school — killing 17 people and injuring another 17. 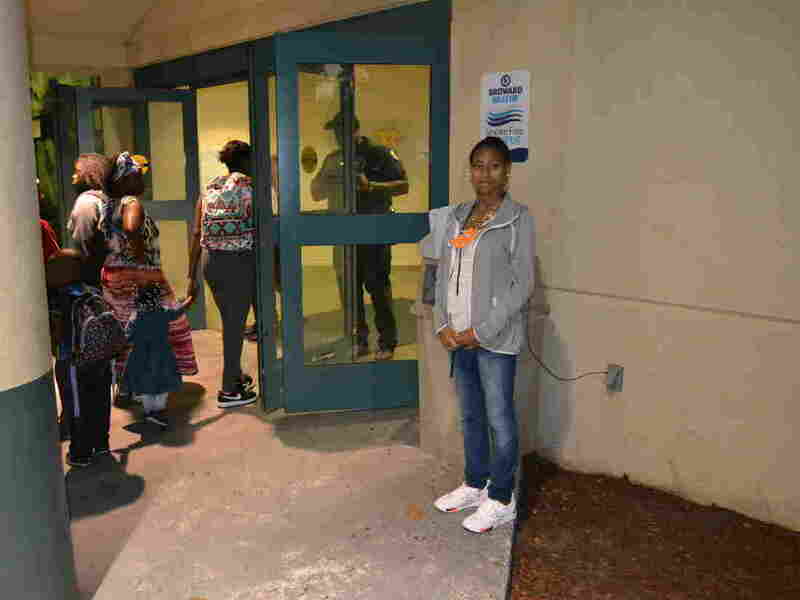 "I have a daughter up there who is seven months pregnant, bleeding, and I can't get in to see her," Patterson said that afternoon, as she lingered on the sidewalk outside the emergency room. "If there's somebody up there that's worse off, and a family member would like to see them before something happens, nobody can get in." Patterson was one of dozens of family members and friends waiting outside the hospital to see loved ones who were being treated for medical concerns unrelated to the school shooting. At one point, hospital officials said the lockdown would be in place all night — although they ultimately lifted it after five hours. Hospital administrators in Broward County — and around the country — said enhanced security protocols like lockdowns are standard when victims of violence are being treated. They argued it's necessary to keep all patients and staff safe. "In a time of crisis like this, it's better to have control over the situation," Dr. Louis Yogel, who was the chief of medical staff at the Ft. Lauderdale hospital, told reporters gathered there the night of the shooting. "You have better control when you control who is coming in and who is coming out." But hospital administrators recognize the indirect consequences of mass shootings — the far-reaching ripple effects on an entire community — like the distress people experience when they're separated from sick loved ones during a lockdown. "It's a real problem," said Alan Butler, president-elect of the International Association for Healthcare Security and Safety. "When you shut down access to a hospital, the people that you're keeping out are in this heightened emotional state," Butler said. "It's not uncommon for people to yell and be frustrated. We've seen scuffles in the parking lot." They're trying to fix it. Butler said hospitals around the country compare notes, reassessing their disaster response plans, after every mass shooting. That was especially true after a sniper killed 58 people and injured hundreds more at a country music festival in Las Vegas last October. People showed up at the city's hospitals not only in ambulances but also in cars and on foot. Some of the medical centers were not used to treating victims of severe trauma. One thing hospitals are considering is whether they're too aggressive about lockdowns, said Butler, who has been in the health care security business for two decades. "Sometimes, we stay in these elevated lockdown stages longer than we need to," he said. Hospitals are also lining up extra staff who they can call in specifically to deal with crowds: the people who are there because of an emergency and the visitors who would've been there anyway. Still, hospital security experts defend lockdowns as an important precautionary measure. As painful as lockdowns can be for family members, "our first and foremost responsibility is treating the patients, and that overrides everything," said Bryan Margeson, corporate security manager for Orlando Health. His private hospital chain treated victims of the Pulse nightclub shooting in June 2016. Margeson said when a mass casualty incident is the result of violence, hospital administrators worry about worst-case scenarios — such as a suspect coming to the hospital to further harm victims, someone trying to retaliate against a perpetrator or big crowds of people rushing emergency rooms. So when there's a crisis at his hospitals, security guards patrol the entrances, questioning people about why they need to come in. If they're not there for medical care, they're not a high priority. On Feb. 14, the day of the Parkland shooting, Fawn Patterson sat on a concrete block in the Fort Lauderdale hospital's parking lot. She was there with two other women who were also hoping to get in. Joedonna Harrison and Shoshanna Campbell were there to see a close friend and coworker who was suffering from cancer. Their friend had been told she didn't have much longer to live. "We grew up together," Harrison said of her friend, whose name she chose not to share. "She been there for me from day one. ... I come every day to see her." Campbell said she worried what might happen if she had to come back the next day. "If I don't get to see her today, I don't know if I'm gonna get to see her," she said. "I have no words. I'm just lost," said Porcha McIntosh. She lives in New York but had been in South Florida visiting family when she gave birth prematurely on Dec. 29. Her newborn son, Calieb, was suffering from choanal atresia, which means his nasal passages weren't fully developed. 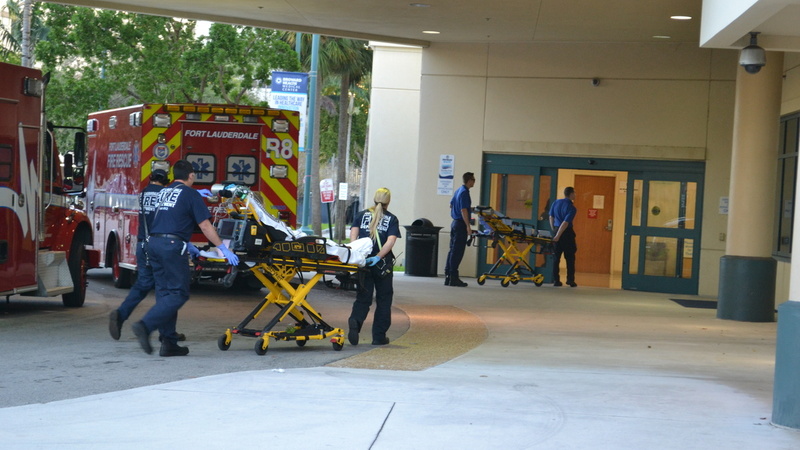 Porcha McIntosh waits outside the door of the emergency room at Broward Health Medical Center in Ft. Lauderdale on Feb. 14. For hours she wasn't able to get inside to be with her newborn, who was in the neonatal intensive care unit. She wouldn't budge from the door, in a near state of panic. "Anything that happens ... I have no way of knowing," she said. Her phone was dying. Ultimately, McIntosh was escorted into the hospital by a staff member and spent the night there with her son. He was released from the hospital about three months after his birth. Recently, she said he was doing better but was still breathing with a tube in his throat. By the time the lockdown lifted at 9 p.m. on Feb. 14, Fawn Patterson had already gone home. Amanda Ray Carrillo's complications with her pregnancy turned out to be not too serious. She was treated and released from the hospital the day after the shooting. "She's beautiful. She's a perfect little girl," Carrillo said in her hospital room a few hours after the birth. "We're so excited." This time, her mom was by her bedside.